They know that I share our lives online. First it was Facebook, asking if I would share this or that about them. Wanting my friends, their teachers, our family to know about this or that. “Sure! It’s kinda like my journal. I wondered if it would change anything, knowing he would be reading. I always said that I write for me and for them, but in my mind ‘them’ meant ‘grown-up them’. I never imagined my 7-year old would want to read my words. But he does and so I’ll share it with him. And I hope that in reading my words, he will find his own. 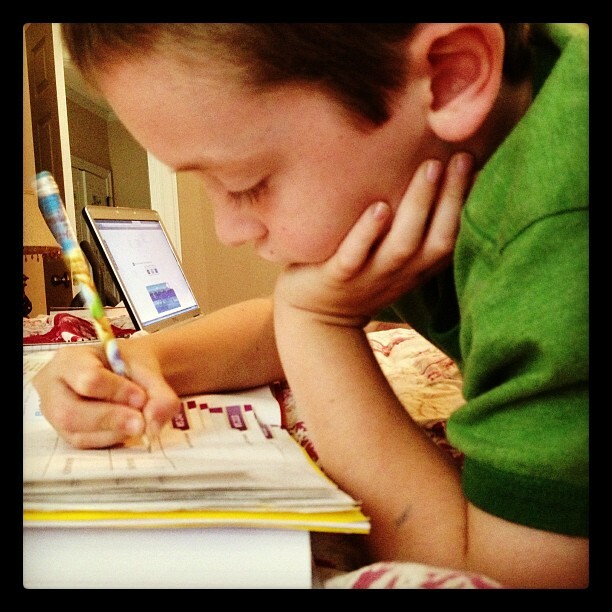 This week we have been working diligently on writing and he’s come a long way. Adding dialogue and using descriptive words. Telling a story instead of just stating facts. It is one of my biggest hopes for them all, that they will be story tellers. I hope they will know this joy that I know. And if it’s not with words, I pray that they will learn how to express themselves somehow. Because, for me, it is in creating that I find myself. that I discover what it is that truly moves my soul and makes me me.